Almost any field has its myth’s that persist despite the efforts to dispel them. Public speaking is no exception to this rule. 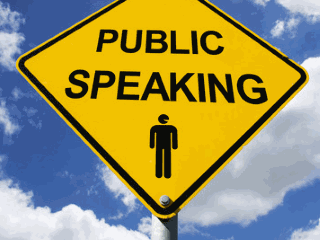 As a learning path, public speaking is riddled with myths that hurt beginning speakers. Herein we’ll explore some of the myths that persist today & cast them aside. Perfection is a myth only perpetuated by those who those out of touch with reality. In actuality it is a dangerously deluded belief system that keeps many from ever trying. Embarking on any learning path requires acceptance of ‘failure’ and challenges as a part of that process. There is no perfection, so let’s drop this speaking myth. Instead, prepare, practice and focus on delivering the best speech you possibly can. Many a novice speaker has told me that they were advised to have a drink or two before a speech to ‘loosen up.’ Alcohol, like any other intoxicant, is far from a performance booster. While it may artificially make you feel ‘relaxed’ it will harm your performance and make you less able to perform your best. Public speaking and alcohol don’t mix under any circumstances. Instead, simply skip the drinking till after your speech and you and your audience will be glad you did. Technology always is a double edge sword. It can both help us and harm us and this definitely holds true in public speaking. Some fledgling speakers assume they must have perfect Microsoft PowerPoint or Prezi slides for their speech or presentation to be successful. Technology can certainly be helpful but it isn’t and shouldn’t be the highlight of your speech. Instead, your message should be the critical focus and technology plays only a supporting role. Having a fear or anxiety of speaking isn’t an abnormal or uncommon experience. The vast majority of our 10’s of thousands of students report experiencing glossophobia or the fear of public speaking. Having a fear or anxiety doesn’t mean you can’t succeed as a speaker, it just means you are human and experience emotions. Instead practice mindfulness, deep diaphragmatic breathing and develop relaxation habits to get you in the right state of mind to perform at your best. Far too many students report that a certain size or type of audience makes or breaks their performance. Whether it is a large audience of 10,000 or a small group of C-level executives, you need to perform at your best as a speaker – no matter what. Instead you need to understanding fundamentally why you are challenged by a particular type of audience or size is key to developing the skills to overcome this irrational fear. The myth is that audience are hoping we fail is far from accurate. Audience (at least the normal ones) generally hope for our success as speakers. Most audiences are secretly rooting for you to do well and understand that speaking is a challenging endeavor. Are there people who will be jerks? Oh, yeah! The best path with negative people is to smile and be thankful you are not them. Instead, you should realize that generally your audience is rooting for you to deliver a successful speech. Many early speakers assume they must memorize their speeches word-for-word. Memorization is not a requirement for a successful speech and quite often it can harm performance and delivery more than help it. Often new speakers will deliver a lifeless speech as they struggle to remember their delivery from memory. Their delivery is choppy, unnatural, and quite lifeless. Instead, master your content and if required memorize the critical parts of your speech practicing them till you can deliver them from memory with vigor, energy and enthusiasm. The hackneyed ‘practice makes perfect’ saying can sometimes be very bad advice. Sure, proper practice is critical to effective speaking but over practicing can pull all the life out of speech. There is a balance between over practiced monotone (robotic) delivery and inspired enthusiastic delivery. Instead know your content but deliver it with vigor and excitement, not a robotic over hackneyed droning. Getting to this point of balance comes with the help of an speech coach. This is horrible advice has no basis in reality. Without question, this is the worst advice I’ve ever heard as it relates to speaking. Sexualizing an audience isn’t an answer to dealing with the fear or anxiety of speaking and its one of the worst persistent myths relating to public speaking. Instead, prepare, practice and focus on delivering the best speech you possibly can. If you are to imaging anything, try positive creative visualization. Some erroneously believe that speakers are born rather than made. Public speaking, like leadership is a learned skill that has nothing to do with your genetics. These are skills you practice and acquire over time, not ones your born with. This myth discourages budding speakers from rising to the occasion and becoming the best communicator they can be. Instead don’t buy into the myth of the natural born speaker and realize you can grow and learn to master this skill like any other. Many self-proclaimed public speaking experts claim a certain single aspect of speaking is all you need to be successful. They claim if you just have the right content, the optimal slide composition or deliver with maximum vocal vigor – you’ll succeed. Fact is, it isn’t a single attribute that will make you successful as a speaker but many. Acknowledge that you shouldn’t ‘cherry pick’ a single speech attribute and assume it means success. Instead, realize it is speech writing, practice, positive habits, and many other aspects that mean a great speech performance. Filler words are those words (um, ah, like, so, you know, etc.) without meaning that litter the delivery of beginning public speakers. If you are in the habit of overusing them, they can get in the way of the effective delivery of your message. If they are sparingly used it isn’t a huge deal. Instead, you should endeavor to minimize them. Perfection isn’t a legitimate objective but a sinkhole that leads nowhere. Personality type shouldn’t ever place us in a limiting box. So many students assume that if they are introverted, they couldn’t possibly be successful speakers. Both introvert and extroverts can be brilliant speakers, the personality you have does not matter. Instead, realize that either can become great speakers with proper coaching & learning the fundamental skills. Over the years I’ve heard a variety of dangerous myths on eye contact like: focus on a single person in the crowd, or focus on the audience’s foreheads or stare at the back of the room. All of these are horrible ideas because we fail to create a connection with the audience or make them completely uncomfortable. Instead, remember that eye contact should be maintained with the audience to build a relationship/rapport with them and this is critical to your speaking/leadership success. Eye contact is a powerful tool in the speakers/leaders body language skillset. Body language is an oft ignored critical part of successful communication for speakers and leaders. Many novice speakers have heard public speaking coaches tell them to not talk with their hands. This advice is extremely off base and incorrect. Our nonverbal ‘vocabulary’ is as important as the words we say and all other aspects of speaking. Instead, when speaking we should use normal, natural body language we do as communicators. Body language is an absolute fundamental of successful communication in speakers and leaders. A lectern is slanted top desk that exists in many speaking scenarios. These wooden standing desks are great for holding books, notes or laptops and little else. Many organizations consistently use them requiring speakers stand lifelessly behind them or grip them for dear life. The problem with lecterns is that it is often used a psychological shield between you and the audience. Lecterns shouldn’t be an excuse to not use effective body language, use movement or otherwise impede you speaking performance. Instead, you should realize that movement can be a powerful tool in your toolbox as a speaker. Many beginning public speakers tell me they were taught by (well-meaning but misinformed) speaking coaches to stay in a single place and not move much while speaking. This is horrible advice in some cases as your speech may benefit from purposeful movement during your presentation. Instead we should realize that our purposeful movement can aid our delivery and reception of our message. Some believe attire does matter for speakers. They assume they can wear whatever they want — no matter the audience. The general rule is that your attire should match within the constraints of the generally accepted requirements of the culture where you present. I.e. if you present at a small startup, less formal attire may be acceptable but at a large financial institution you may want more formal attire. Instead, the rule of thumb is simple, just match the attire of the organization in question in business attire. Despite this persistent speaking myth, even expert speakers get ‘butterflies in their stomachs.’ Ask even the most seasoned of speakers and they’ll tell you they experience some level of anxiety speaking. Human emotions are natural and should be embraced and understood rather than dismissed. Instead, the seasoned speaker has learned to manage his/her feelings and get his butterflies to fly in unison. Unfortunately, this list is only a short list of the myths that persist in public speaking. Hopefully it is food for thought and helps you reimagine your capacity and potential as a successful speaker. Should you have any questions or comments, please leave them below. If you like this post consider joining our monthly newsletter for more insights like these. 2 Responses to "Public Speaking Myths"
Ooh nice, this was a great reminder that almost anyone can master the art of public speaking. It’s so easy to get caught up in lies like “introverts are bad public speakers” or “I’m not a natural public speaker.” The reality is, public speaking is a skill that can be practiced and mastered, like an instrument or a sport. I’m soo glad it was helpful to you. Anyone can master these skills with the right training and practice. I wish you success in your public speaking endeavors!